Amazon quiz is now on a daily basis but only for 4 hours from 8 AM to 12 PM and a great chance to win huge prizes from Amazon. 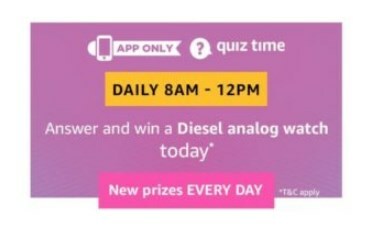 In today’s Amazon app quiz, Answer 5 simple questions stand a chance to win a Diesel Analogue watch . Q1) If you were visiting the ‘Tabo Monastery’, where would you be? Q3) When referring to genres of music, what does ‘R and B’ stand for? Q4) A 12-carat gold piece is considered half gold.